But in a seven-page order on Friday, the judges said they will not disturb the 2016 elections. “… the court finds that the status quo should not be altered … The 2016 election will proceed as scheduled, without interruption of delay, under plans H358 and C235 [the plans used in the previous election],” the judges wrote. As you may recall, the post-Shelby retrials were concluded last September. 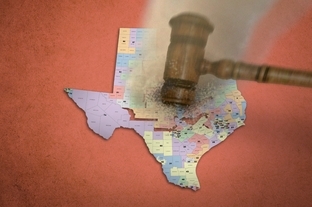 As that seven-page order points out, those were trials over the 2011 maps, to make a determination about discriminatory intent, which would potentially subject Texas to preclearance again under Section 3 of the Voting Rights Act. A trial on the Section 2 claims for the 2013 maps still hasn’t even been scheduled. Since those maps are basically the court-drawn interim maps from 2012, there may not be any relief to be had anyway, but still. Shouldn’t we have this mess resolved by now? At this rate, it’s a close call whether this litigation will be wrapped up before the 2021 redistricting cycle. Sheesh. Until journalists and bloggers start analyzing Hispanic voter participation in comparison to the share of the total population which is made up of adult Hispanic citizens, instead of total Hispanic persons, Hispanic voting will always seem to be at low levels. When about half of total Hispanics in Harris County are not citizens or are too young to vote anyway, it affects this analysis. We see this most starkly in the districts encompassing Gulfton, which appear Hispanic on paper, but on election day are mostly elderly white homeowners.